Vedantu.com - No.1 online tutoring company in India provides you Free PDF download of NCERT Solutions for Class 11 Chemistry Chapter 1 - Some Basic Concepts of Chemistry solved by Expert Teachers as per NCERT (CBSE) Book guidelines. 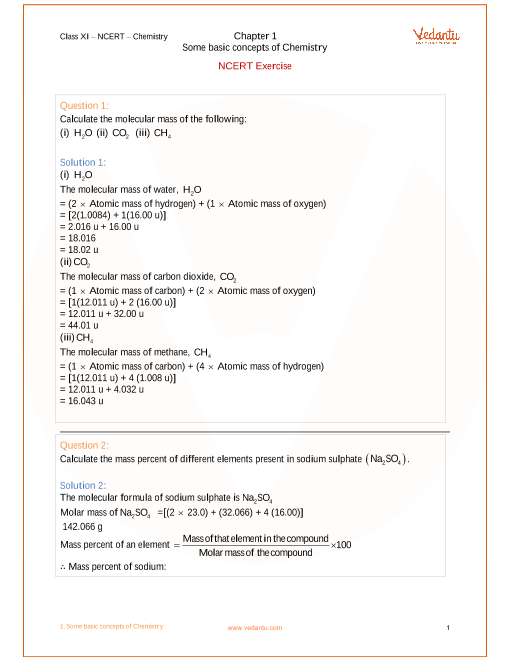 All Chapter 1 - Some Basic Concepts of Chemistry Exercise Questions with Solutions to help you to revise complete Syllabus and Score More marks. Register for online coaching for IIT JEE (Mains & Advanced), NEET, Engineering and Medical entrance exams. NCERT Grade 11 Chemistry Chapter 1, Some Basic Concepts of Chemistry will build a foundation for all the further topics of Chemistry that the students will learn. It includes the basic concepts, formulas reactants, reagents, products, catalysts and all that will help to deal with chemistry in the simplest form. NCERT Grade 11 Chemistry Chapter 1, Some Basic Concepts of Chemistry will cover topics such as Importance of Chemistry, Nature of Matter, States of Matter, Classification of Matter, Properties of Matter and their Measurement, Physical and chemical properties, Measurement of physical properties, The International System of Units (SI), Mass and Weight, Volume, Density, Temperature, Uncertainty in Measurement, Scientific Notation, Significant Figures, Dimensional Analysis, Laws of Chemical Combinations, Law of Conservation of Mass, Law of Definite Proportions, Law of Multiple Proportions, Gay Lussac’s Law of Gaseous, Volumes, Avogadro’s Law, Dalton’s Atomic Theory, Atomic and Molecular Masses, Atomic Mass, Average Atomic Mass, Molecular Mass, Formula Mass, Mole Concept and Molar Masses, Percentage Composition, Empirical Formula for Molecular Formula, Stoichiometry and Stoichiometric Calculations, Limiting Reagent and Reactions in Solutions. The above-mentioned topics are not only explained in a very easy to understand manner but will also help the students to build a strong bridge between the simple concepts learnt in lower grades with the complex concepts to be learnt further. NCERT Grade 11 Chemistry Chapter 1, Some Basic Concepts of Chemistry is from Textbook Part 1 and belongs to Unit 1. Unit 1 and Unit 2 hold 11 marks of weightage in the final examination. Get 100 percent accurate NCERT Solutions for Class 11 Chemistry Chapter 1 (Some Basic Concepts of Chemistry) solved by expert Chemistry teachers. We provide solutions for questions given in Class 11 Chemistry text-book as per CBSE Board guidelines from the latest NCERT book for Class 11 Chemistry. The topics and sub-topics in Chapter 1 Some Basic Concepts of Chemistry are given below. Ex 1.10.2 - Reactions in Solutions. Chapter 1 - 36 Questions with Solutions. Other than given exercises, you should also practice all the solved examples given in the book to clear your concepts on Some Basic Concepts of Chemistry. Download the free PDF of Chapter 1 Some Basic Concepts of Chemistry and take the print out to keep it handy for your exam preparation.